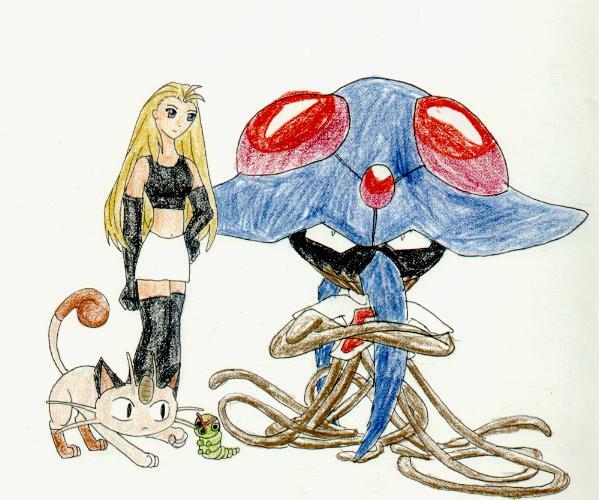 Renee: Posing with her pokemon, Taco (Tentacruel), Phil (Caterpie), and Bagel (Meowth), Renee is looking rather spaced-out. o.O;; Not how she acts on a regular basis, mind you. 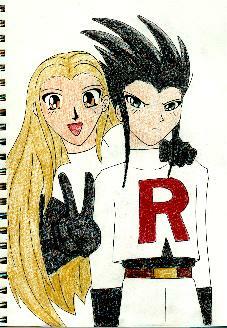 Renee with Nori when Nori infiltrated the Rocket Base in Saffron. 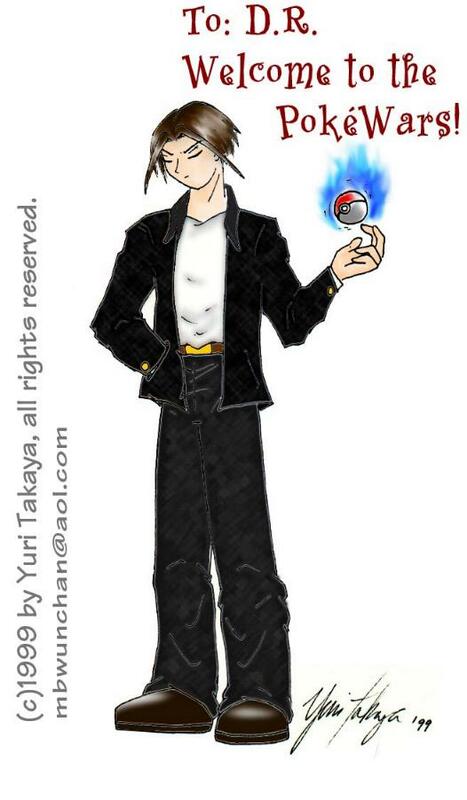 Vincent: Trying to look intimidating, Vincent shows off his psychic powers by levitating his pokeball which contains an Abra. Note from the artist: Silver Sky was nice enough to let me draw her character, Christy. Here she is, lounging around with her Eevee perched on her knee. 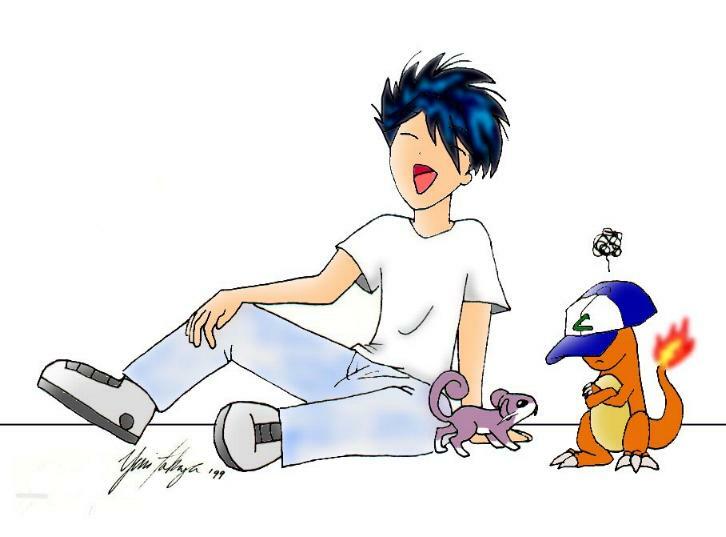 Note from the artist: Here's a kawaii little pic of Jeff, Charmy, and Caspian! Thanks to Jeff's writer for letting me draw this! It was loads of fun! Renee poses in full Rocket garb, complete with a Rocket Ball. 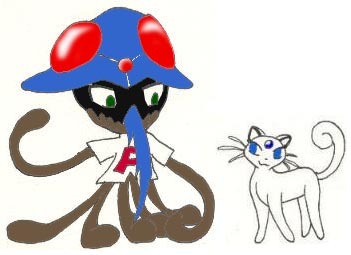 Taco the Tentacruel interacting with Blizzard the Persian. Yuri's depiction of Andrew O'Reilly, Newton Haights' character. A chibi version of Andrew O'Reilly. A cute drawing of Blaze, Andrew's Growlithe. Renee is hugging Bagel the Meowth in this picture.